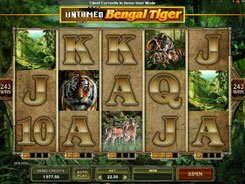 Powered by Microgaming, Bundle in the Jungle is a feature-rich three-reel slot machine played over a single payline. 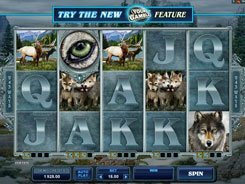 Having a Vegas-style layout, the slot comes with a wild animal twist with its reels set against a jungle background. Apart from cherries, bars and sevens, the symbols set incorporates birds, chimpanzees, crocodiles, gorillas and jackpot-triggering lions. 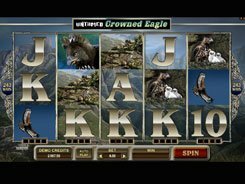 The betting range is pretty affordable going from $0.1 to $10 per spin, with a chance of taking away a $5000 top prize if betting max. All the symbols pay out x2 to x500 for three of a kind. There is a Trail counter under the reels that is filled up every time numbers appear on the reels, until the Start position gets lit up starting the bonus feature. 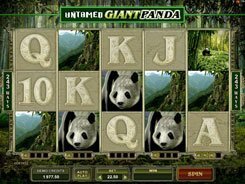 On the second screen, you will have to advance through the map collecting cash bonuses, multipliers, free spins, and other bonus extras for even more winnings. 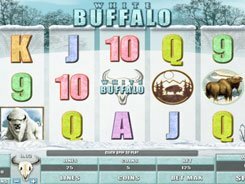 On top of that, you are randomly awarded Nudges and Holds in normal spins, enabling you to control the reels by fixing or spinning them on your command. 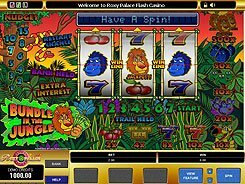 Surprisingly for a 3-reel slot, Bundle in the Jungle has a whole host of goodies that make for a fascinating and exciting experience. PLAY FOR REAL MONEY!